Gone are the days when publishing an article about your products every day could guarantee loads of traffic. These days, you need to be more creative. So in this tutorial, I’d like to talk about how to get more exposure for your products using two underrated marketing techniques: product reviews and giveaways. How powerful are these strategies? Proof 1. When Josh Earl launched a giveaway that went viral, he generated almost 200k leads in just 11 days. According to him, that’s an email list growth of 3,418% in less than 2 weeks! Proof 2. When Bryan Harris replicated Earl’s strategy and launched a giveaway of his own, he managed to get more than 2.2k email subscribers in just 10 days! 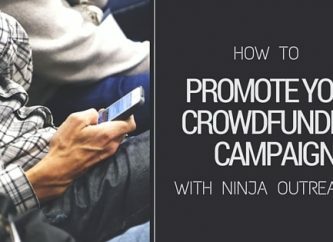 Let’s dive into how you can replicate these tactics with NinjaOutreach then. The following tutorial works whether you’re looking for giveaways, product reviews—even guest post opportunities. Just modify your keywords to suit your purpose. In this method, you can search straight from within the platform and use NinjaOutreach built-in filters. Choose what type of post you’re after; in this case, Product Reviews. Alternatively, you can also run a search without using the filter. Just use [Your Topic] Review. This method will provide slightly different results from the first one, so it’s worth trying both approaches. So for example, here’s how you can search through NinjaOutreach. Now, let’s say you want to find all the websites that linked to one of your competitors, but you don’t want your competitor’s URL to show up in any of the results. If you search via Google, you can load the links to your NinjaOutreach chrome extension, manually review the results, then add the leads to your list. 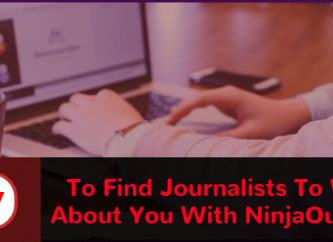 How to use NinjaOutreach to collect contact information from Google results. If you do your search in the NinjaOutreach Search tab, you can simply review and add to your list from within the app. This method will let you replicate Bryan Harris’s own steps much faster with the help of NinjaOutreach. First, choose a giveaway that’s highly desirable for your target audience. For example, if you’re a food blogger with a primary focus on organic cooking, you should win over your target subscribers with a Whole Foods gift card. If you’re a fitness blogger, offer a gym membership for a year. If you’re a beauty blogger, offer a limited edition beauty kit or a Sephora gift card. In this case, let’s say you are a marketing blogger and you’re thinking of doing an email marketing tool giveaway to your audience of marketers, business owners, and agencies—a set of professionals for which email marketing is an essential. Second, pick a prize from a well-known company so you can piggyback on their authority. To do that, Google for “[Keyword] + [Service]”. Once you have a good set of prospects, simply import the results into your NinjaOutreach list. Once done importing, go to your NinjaOutreach web app, find this particular list, and sort the saved prospects by a number of shares or followers. The higher the the better. This way, you’ll see the most popularly shared or followed email marketing service provider in your niche. Say, out of all these prospects, you’ve finally chosen to do a giveaway for the popular email marketing tool, Mailchimp. What’s next? Getting your giveaway copy ready. You can get ideas by taking a look at other popular giveaways. The more popular they are, the better. To do that, you can head to giveaway listing sites and get ideas from the most popular giveaway headlines. Is it coveted by your audience? 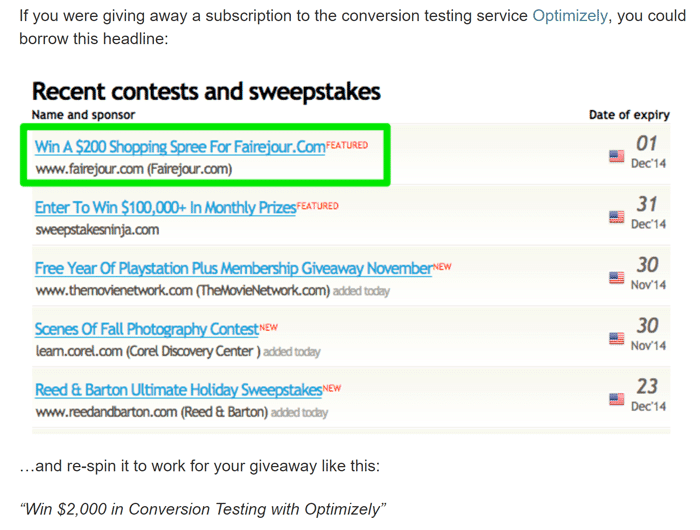 Will the headline of your giveaway turn heads? Is the prize owner likely to share your giveaway? Whatever gets the highest score shall be your product giveaway. A popular email marketing tool, and a big subscription. So now you have your product giveaway and your copy. The next thing to tackle is a promotion. After all, how can a product giveaway be effective if nobody knows about it? Look for top influencers and bloggers who’ve written or promoted anything related to your giveaway before. Make a list of prospects for each category. Then, type in your niche keyword. You can also search for all the blogs that have written about email marketing. Just go to Search > Website and Blogs and use variations of your niche keyword. For ex. Email marketing tool, email marketing tools, top email marketing tools, best email marketing tools, etc. 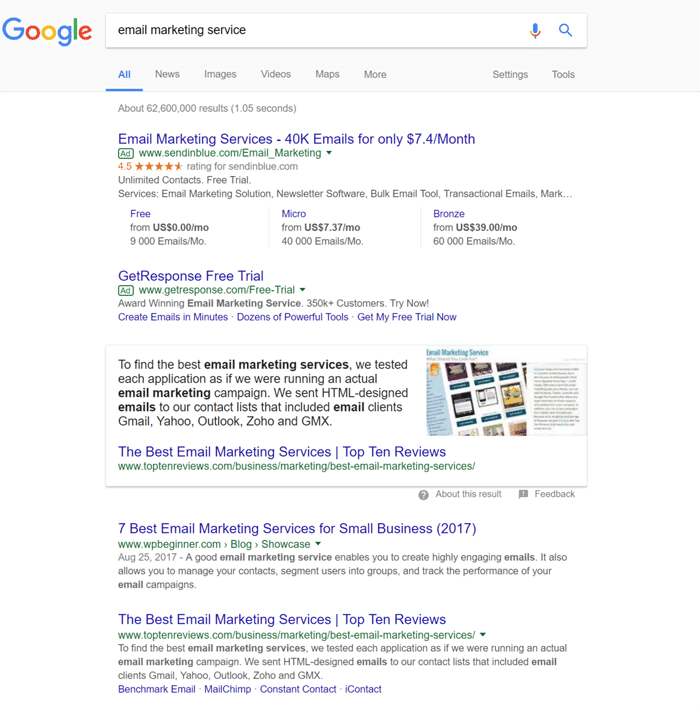 You can also conduct the search via Google using advanced search operators and just import the right prospects into your list. Here’s more on how to import search results from Google and into your NinjaOutreach account. Now, even if you nailed the niche (email marketing / email marketing tool), not all people may think your giveaway product (MailChimp) is so great, and this might lower the chances of them promoting it. So to up your chances, create another list of prospects consisting of bloggers who’ve written, interviewed, promoted, or shared anything about your product within the last three to five months. Doing this separately could give different results compared to not using any filter, so it’s worth trying different approaches. Just add any of the prospects that fit into your new list. Before doing any outreach, make sure to integrate your email first. Next, learn how to send emails and set up outreach campaigns in NinjaOutreach. Now, all you need is a script. Below are two examples of outreach scripts that you can take ideas from or modify. The first is one of our preset templates in the app, and the other is what Bryan Harris actually used in his giveaway campaign. My name is Dave and I run NinjaOutreach.com - a blogger prospecting and outreach software. We just launched and we’re looking to get the word out through product reviews - would you be interested? I'm Bryan with Videofruit. Been following your blog for awhile and love your work. I know you're a big LeadPage's fan and notice you linked to one of my favorite LeadPages blog posts recently. 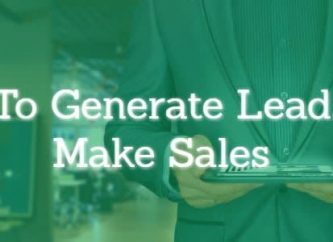 I'm doing a big giveaway for 10 Year LeadPage Subscription and thougth you and your audience might find it interesting. PS: If you'd like to share it, you can click here to tweet it automatically. Once you have your scripts ready, here’s how to set up an outreach campaign. Once your campaign is running, learn how to manage your campaign and your prospect relationships. Hope this helped you put together some of your own product promotion campaign ideas. As always, feel free to reach out to our Support Ninjas if you hit some snags along the way.